Let’s face it – you never know when an emergency will happen. 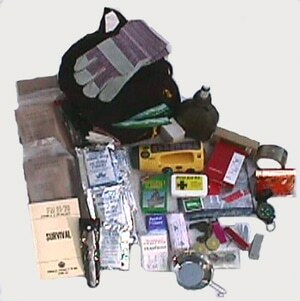 It’s good to be prepared, but how prepared are you for something that might happen while you’re away from your house? We saw this kit on YouTube and wanted to share it with you. Watch through the link below, “Sootch” does a great job showing everything he added and why it was included. Things we would add if it was our kit? Include some kind of strap with clips at both ends so the box could be carried “hands-free.” Also, we’d tape the “list of ingredients” to the inside of the lid. Please find below a list of most everything he included, with a link to a good price for many items. Hope you enjoyed the YouTube (and knowledge) as much as we did.